We were sitting in a boat on the estuary that surrounds the Knight Inlet Lodge in Canada watching the younger Grizzly Bears on the far shore. 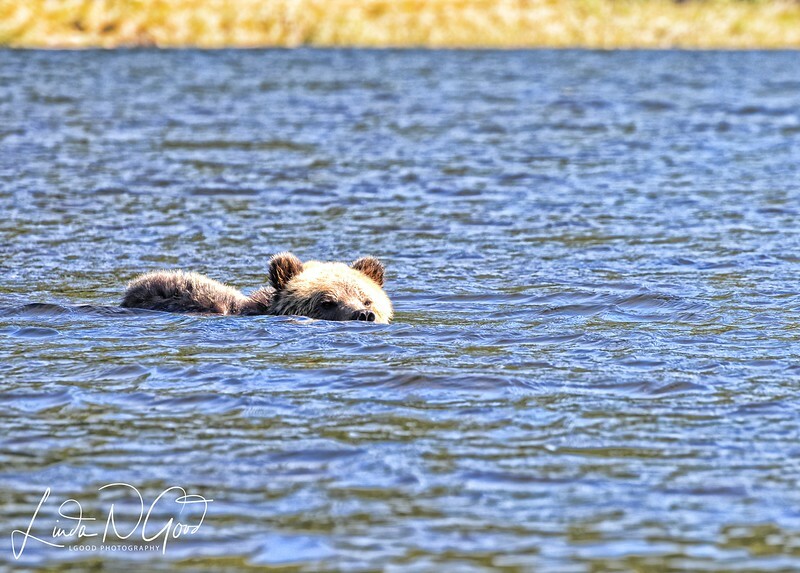 This Grizzly girl, named Amber, decided to swim across and join some of the other juveniles on the northern bank. Even though the guide cautioned us to be quiet when she got out of the water, he didn't really need to. Every occupant on board the boat was speechless and watching her every step. All you could hear was the clicking of cameras. She came ashore within less than 10 feet of the boat. Everyone got wet when she shook herself dry, like a dog does - trust me, that is the biggest dog I've ever seen. Have a thrilling day today my friends. Linda, Fabulous capture of this young Grizzly Bear, and the story that goes along with her. Love the image and the story !!! Stunning shot and sounds like quite an adventure! Awesome catch, kind of looks like a furry alligator. What a wonderful experience--and to get pics to prove it, even better!